We have spent more than 16 hours on testing and reviewing Kinsta. Our review is split up in two sections. In the first part of our review you will find a short summary of Kinsta with ratings, pros & cons and stats such as server loading time. In the second part we will go in-depth and look at the details so you get a detailed understanding of what it’s like to have your website hosted at Kinsta. Kinsta provides managed WordPress hosting, which means they are a perfect fit for beginners and people who don’t want to bother with technical stuff. That being said, Kinsta is not only for beginners, there are also a lot of big brands who use Kinsta such as Asos, Tripadvisor, Freshbooks and Ubisoft. We recommend Kinsta for beginners, it’s the most user friendly hosting provider available. Are you ready to get started with Kinsta? Click the button & visit Kinsta to get started! Server performance and uptime are important factors if you run a serious website, or if you want to rank on search engines such as Google. What happens is that if you have a high loading time or downtime it will have a big effect on your SEO, especially on Google. It’s a big part of their algorithm. People pay thousands of dollars to get their websites’ loading times improved, and it helps – you can do a lot for it on your website, but your hosting is what defines your loading time and uptime the most. Kinsta is one of the few hosting companies that have a public record of their servers uptime. We have tested their servers and checked if it’s true, and it is – they have had zero downtime during our testing period, they are the only server hosts to have achieved that so far, and we have tested over 5 popular hosting providers. We have tested page speed with one of our WordPress themes on their servers and we’ve had impressive results. The website loaded in less than 0.3 seconds (0.294 average) which is way faster than average. When you first log in to your Kinsta account you’ll be prompted with a lot of options, but if you notice the top right corner and bottom left of our screenshot, you’ll see the most important things are easy to access – support and creating your website. You can also see your visitors, disk usage and much more, for a constant update on how your website is going. We are using a test account for our review, so the visits, disk usage and so on is of course 0. If you scroll down a little you’ll notice the next helpful thing, with quick links to their knowledge base, guides to learning WordPress and finally system status. System status is a big thing, it shows you how their servers are running – you can even subscribe to the updates so you get a notification in case one of their servers is having downtime or issues. It’s overwhelmingly easy to create your website with Kinsta. When you click the “Add Your First Site Now” button, you get a nice looking message asking you to fill out server location, website name and domain name. Having the option to choose your own server location is unique. Big brands like Namecheap, GoDaddy and more do not let you choose anything besides “EU” or “US”, which harms your page speed. Having the option to pick your location as “Finland” if you’re from Finland for example, is an important feature that should not be underestimated. After that you’re done. You now have a fully functioning WordPress website where you can start building your blog, eCommerce shop or any other website you’re dreaming of. Of all the hosting providers we have tested, Kinsta is by far the most user friendly one. Kinsta has lots of different hosting plans, picking from them can be a hard task if you’re a beginner or a non-tech person. Every plan comes with free SSL, free CDN, 30-day money back guarantee and much more. There is no “best for value” plan or so, it all depends on your needs. The pricing on the cheap plans are mostly based on disk space and WordPress installations. If you run a blog or a small shop we recommend that you pick the starter plan. If you run a bigger website or have more advanced needs, then you should look at the more expensive pricing plans. If you already have a website and you’re considering switching to Kinsta then you’re in luck as they provide 1 free website migration for new users. Kinsta has multiple guides on how you can migrate your website to them in different ways, so you can pick the one that’s easiest for you. There is no perfect migration option for everyone, it all depends on what you feel safe with and how much experience you have. If you’re a beginner we recommend that you use Kinstas own migration option service, where they take care of everything for you, so you just have to lean back and relax. If you’re an advanced user you might want to do it yourself to ensure that everything is done your way. If you choose to do it yourself then Kinsta has step-by-step guides that show you how to do every part of it. Kinsta focuses on one thing, WordPress hosting, which means they’re extremely good at it. They have a knowledge base available which offers answers for the most common questions. If your question is not answered in their knowledge base then you can contact their support. Their support has a lot of experience with WordPress and can help you out with almost every issue, even the technical ones. 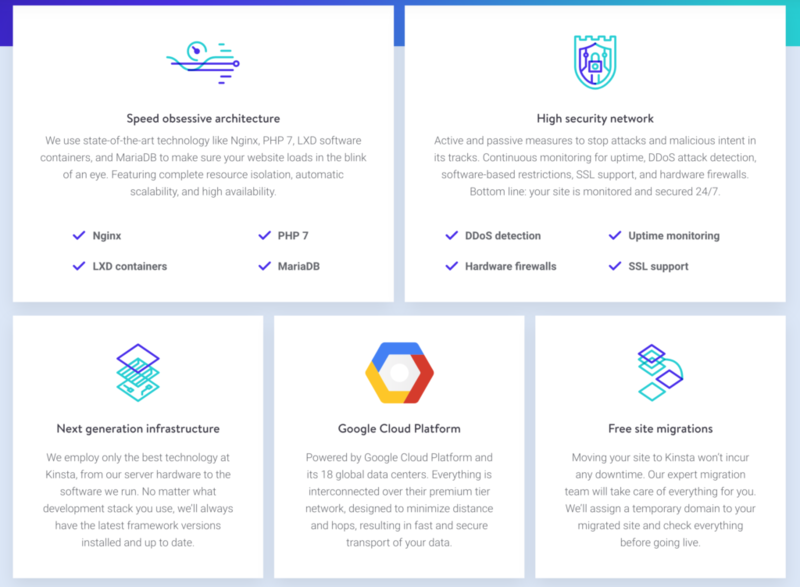 When you have your website hosted at Kinsta you get a lot of unique features such as DDoS detection and firewall. Your website will be hosted at Google’s Cloud Platform which means your loading time will be way below average, in fact it’s hard for other brands to compete with the kind of loading time you can get at Kinsta. You also get 1 free server migration, so if you currently have your website at for example GoDaddy or WP Engine, then you can transfer it to Kinsta for free. Another great thing about having your WordPress website at Kinsta is that they have automatic daily backup, so if you accidentally delete something or get hacked, then they have you covered – within a few minutes you can get your website back as it was the day, week or month before it happened. So we have covered that Kinsta comes with a great server and performance. Something that really matters for most people is support, after having created a question and having them help us solve it we can safely say that they have expert WordPress knowledge and their supporters are actual developers who sit ready to help. When we started a chat with their supporters they answered within 2 minutes, and were very kind and patient. Kinsta also provide email support that you can use, in case chat isn’t the way you prefer to get help. The only thing we can say is missing support wise, is phone support – they do not provide that currently. After testing every aspect of Kinsta we can genuinely say that it’s a great hosting provider, in fact it’s in our top 3 of all hosting providers, which says a lot because we have tested every popular hosting provider. There are a few small downsides of Kinsta. The first thing is the lack of phone support. A lot of beginners have troubles which are easily fixed during a short phone call. Kinsta does have a support chat where you can get instant support instead, so it’s not a big deal. The second thing is that Kinsta is expensive, they offer the same as lot of other hosting companies just a lot more expensive. There is a thing they do better than almost every other hosting companies though, that’s support and server quality. their servers are a lot quicker than their competitors and have a lot less downtime. If you look at for example Namecheap in recent time, they have around 93% uptime where Kinsta have around 99.9X uptime – 93% might still sound high, but it still means it’ll be down a couple of hours every month which can cost a lot of money in the long run. Kinsta does for sure have the most user friendly interface. Any beginner can create a website easily when using Kinsta, that’s pretty unique. Most hosting companies have old outdated interfaces that are hard to use, which eats up a lot of time. Overall we would recommend Kinsta to beginners, it’s a perfect platform if you don’t want to spend time on server related issues and other tech stuff. Their support is incredibly nice, helpful and have a huge amount of WordPress knowledge. Most other companies such as Namecheap outsource their support to Russia to ease their budget, it’s awesome to see that Kinsta does not do that. So to sum it up, awesome product, support and servers. 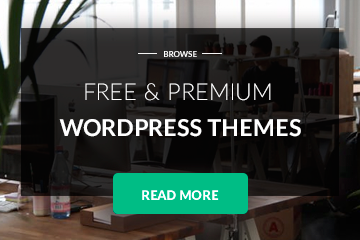 Type in your email to receive all of our free themes and plugins.